Former Kiwi filly Verry Elleegant produced a great VRC Oaks trial with a resounding win in the Group 3 $150,000 New Zealand Bloodstock Ethereal Stakes (2000m) at Caulfield today. 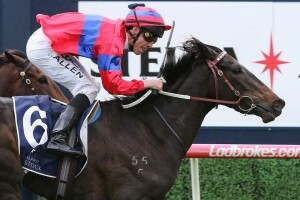 Verry Elleegant, above, produces great VRC Oaks trial with win in Ethereal Stakes at Caulfield. Photo by Ultimate Racing Photos. Verry Elleegant was only having her second start for the Darren Weir stable after finishing third to stablemate Amphitrite in the Group 2 $200,000 Edward Manifold Stakes (1600m) at Flemington on October 6. The former New Zealand trained filly is now the $3 favourite at Ladbrokes.com.au for the Group 1 $1m Kennedy Oaks (VRC Oaks) (2500m) at Flemington on November 8 but Weir is uncertain if she will have another run leading into the Fillies Classic during Melbourne Cup Week. “Do we go to the Wakeful or do we back up next week and run in the 2000m race at Moonee Valley or do we hope and pray and hope we got her fit enough to go to the Oaks off of that,” Weir said. Winning jockey John Allen settled Verry Elleegant midfield and after the filly had a tendency to over race in the early stages, Allen was able to get her travelling smoothly on the fence all the way down the railway side. Allen looked for the way clear on the home turn and Verry Elleegant ($2.35 favourite) wound up down the middle of the track to record a half a length win over the consistent Aristia ($11). The Cindy Alderson trained Sizzleme ($21) ran on well to fill third spot. “It was a good ride,” Weir said. Co-trainer Matt Ellerton wouldn’t decide if Aristia runs in the Kennedy Oaks until after she steps out in the Group 2 $300,00 Wakeful Stakes (2000m) at Flemington on November 3.